Are you sick of the matcha recipes yet? I don't think I ever will be! Something new I've come across is flavored matcha! The Matcha Reserve provided some peach matcha to experiment with. I was a little skeptical at first about flavored matcha. Matcha is known for it's health benefits so the idea of adding flavor worried me a bit. I was pleased to find out that the flavoring is natural and sugar free! What the flavoring did do was add a wonderful fragrance and taste. I used a very basic cake recipe here because I wanted the peach flavors to come through really well. I placed almonds on top of the heavy cream in the center and on top but that could easily be replaced with fresh fruit to pair with the peach flavor! My parchment paper wasn't smooth around the edges to give the cake a little texture. If you want them perfectly round you can follow this tutorial on cutting the parchment paper or simple butter and then flour the pans, making sure to tap off excess flour. As you probably can tell I'm very fond of almonds. As mentioned before, I think fresh fruit would also go well in the middle. The cake was very tender and what the almonds do is give the cake a nice crunch. On top, I was more delicate with the almonds. I tried to sprinkle them gently and some ended up sticking up which I really liked the look of. 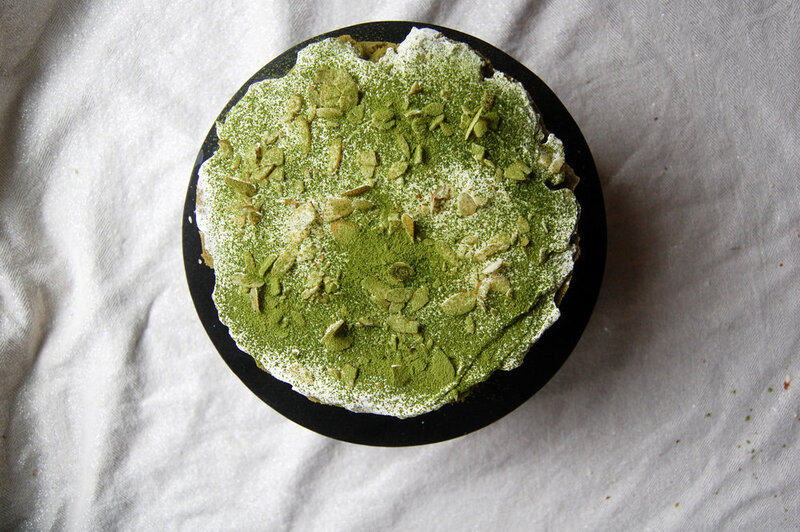 This matcha is so good I sifted some extra powder on top of the cake. Not only does this give you an extra punch of matcha but also a lovely aroma of peach for the whole cake! The heavy cream was not super binding but it did the job. It almost turned out like a matcha sandwich! What I really enjoyed about this flavored matcha was that the peach flavor wasn't overbearing. It lightened the taste of the matcha which is nice because matcha can often have a heavy flavor. Peach flavor is such a wonderful summer flavor and as summer approaches, you want this cake in your oven! The matcha reserve has 8 different flavors to choose from. You can find flavors from peppermint to blueberry! I think any of their flavors would taste great tn this cake! You can use code NAZANINMATCHA for 15% off your purchase on the matcha reserve website.